Contact us to arrange or plan your maintenance and service contract with SEERS Medical. On-going service and maintenance programmes will ensure your couches are utilised to their full potential. All SEERS Medical treatment tables & couches are designed to provide longevity & trouble-free operation. Our products require minimal maintenance due to the innovative design, assembly methods and the use of high quality components throughout the product range. However, this does not mean they do not need regular inspection and servicing! For safety reasons, all couches require a minimum of an annual inspection and service to ensure that they are in good working order, safe for the operator to use as well as being safe for the patient, both of whom would be at risk in the event of an avoidable adverse incident. This must be taken into consideration and strictly adhered to. We are pleased to offer a Planned Maintenance & Service Contract to ensure that our products are working correctly, minimising potential downtime and reducing inconvenience to the user. All maintenance and service work is carried out by our authorised and trained engineers across England, Wales and Scotland. 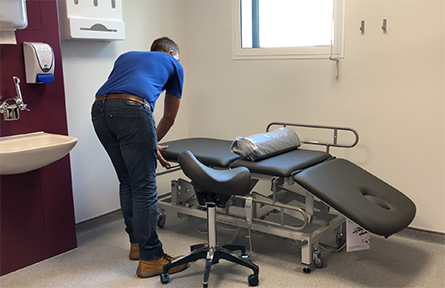 With our many years of experience in the manufacture and distribution of treatment couches both to the UK and overseas markets, we are also frequently able to service & repair products from other UK manufacturers and distributors. For this reason we stock many regular spares, such as actuators, hydraulic pumps, gas struts, castors, caps, inserts, adjustable feet etc. In addition, we also manufacture our own upholstery panels, so we have the ability to supply replacement sections both for our own brand products as well as the majority of other makes and brands, many of which we hold stock of the many colours and types of vinyl that are necessary for replacement parts. We've selected English in Zambia for your default language and country.